The game was designed and developed by Tom Francis, and if you do not recognise the name, then you have probably not played his previous game, Gunpoint. As a side note if you have not played Gunpoint then you really should, it’s really good and worth every penny in my opinion. Anyway… I digress. The game has a top-down 2D-sprite look, which reminds me of the original GTA. It has a beautiful style with bright neon colours that I certainly find very appealing. 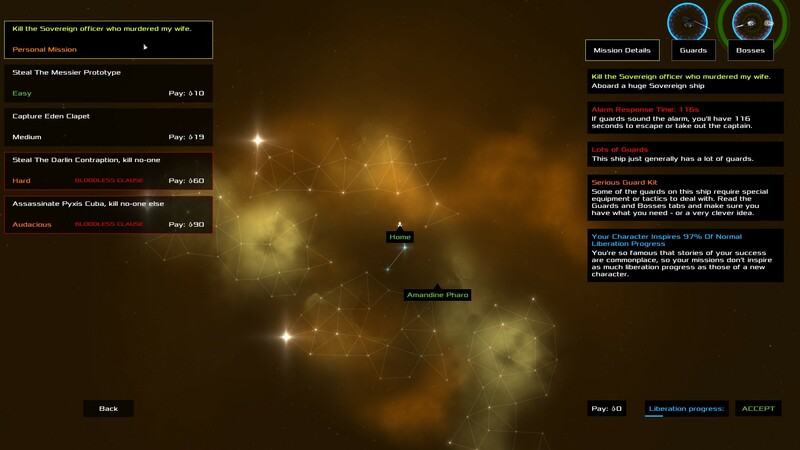 The game does have some links with the current Rogue-like boom – Ships that you encounter are randomly generated, with a set of guards on board that match the difficulty of the mission. Weapon design has a lot of input on how you achieve your goals; I love that you are given a choice of going in all-guns-blazing, or trying a stealth route, or anywhere in-between. There are a ton of different weapons available in the game, and you can pick up any weapon that is dropped by an enemy, which you can sell back to a friendly station. There was obviously a design decision to make most of the common weapons have a sell value of zero and it’s one I respect. It encourages you to take more missions, or to go out into the world and capture a ship to gain some extra cash. At the beginning of the game, you get to choose your character. Each character has a randomised backstory that you work towards, by taking missions and a randomised base set of equipment. You control your character with a mixture of mouse and keyboard inputs, and there is nothing really new here but the controls work so well that they become second nature really quickly. When flying your pod, the view automatically zooms out and it’s only then that you get an idea of the size of the game you are about to unravel. 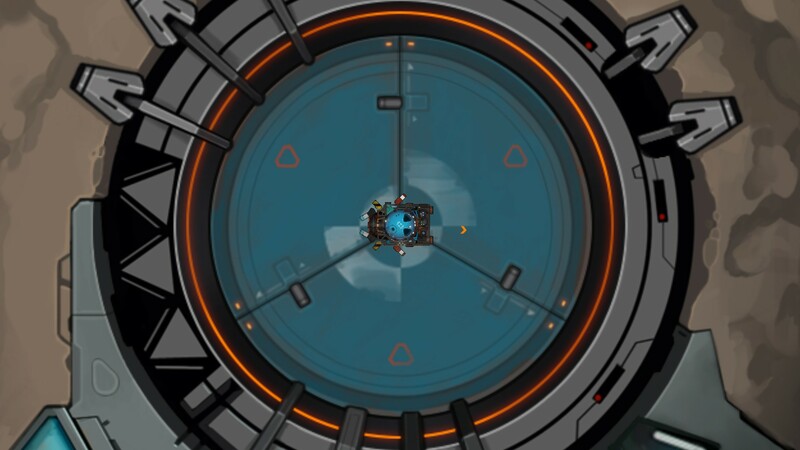 Zooming can be controlled via the mouse wheel, which comes in really handy when you board a ship because it will help you plan. This is where the game has a similarity with two other games that I have really enjoyed, Hot Line Miami and FTL. If you have a blunt weapon like a wrench then you can use it to knock guards unconscious, you also have the ability to slow down time and this can be really useful to get you out of incredibly sticky situations. If it all goes horribly wrong then you will be killed, or knocked unconscious. An unconscious body is thrown out into space and then you are given some time to remote control your pod to pick you up and get you back to a friendly station or just head back to the ship you were thrown out of, to seek revenge. 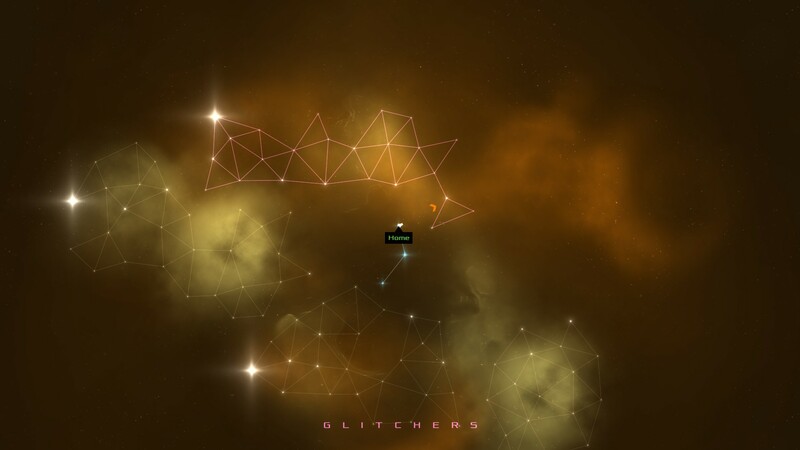 It’s moments like this, or moments where you accidentally set off an explosive in the middle of the ship and are then thrown out into space that makes the game feel tense. There is a certain flow of the game and I hate to use such hype-based words, but it’s pretty close to flawless. It’s sheer joy when it all just works and your plan goes smoothly, you execute a perfect move of killing or knocking out a certain group of guards to get to your goal. Prepare yourself for this one, sit down and take a deep breath. If you’re not familiar with my buying habits then check out my other game reviews and you’ll get the impression that I rarely pay full price for games. I’m a bargain hunter and really like getting my money worth. 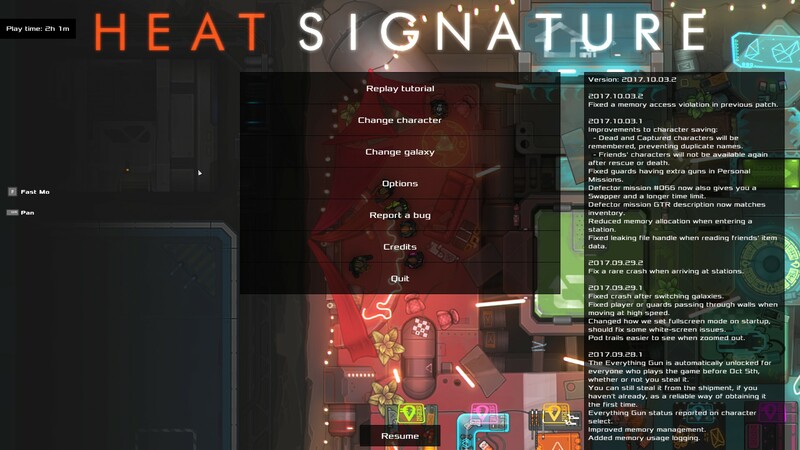 So you may be quite shocked to hear that I paid full price for Heat Signature. I even bought it via Humble Bundle so that the developer gets a better deal. I’m also going to say that it’s been worth every penny so far and I’m sure that I have many hours of gameplay ahead of me. 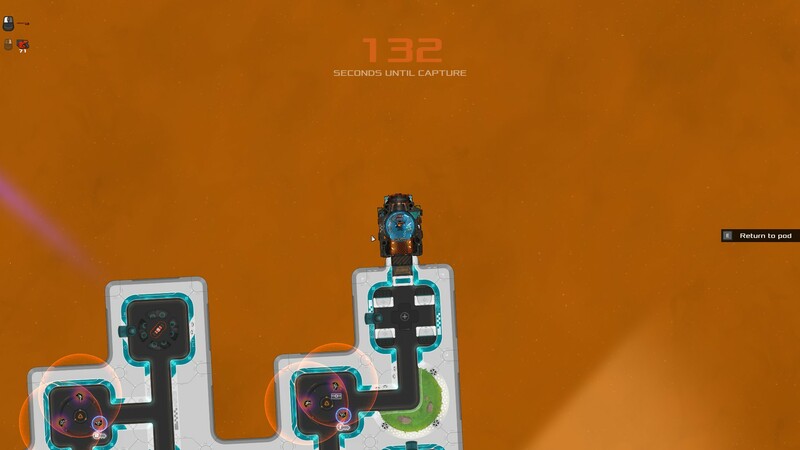 I’d really like to be able to pick holes in Heat Signature; I’m sure that some people will find it’s gameplay repetitive and boring but I personally don’t. Graphically it’s not breaking any new ground but it is beautiful to look at and runs super smooth even on a not very powerful Laptop. If I was being overly critical I would say that I would have expected the game to have a Mac and Linux version from day one. Tom has yet to confirm if there is going to be one or but I am hoping. He has spent the last three and a half years on the project so if he wants to take a break and enjoy people enjoying his game then I’m fine with that, he has earned it. We wish Heat Signature all the success it deserves. Have you had the chance to play it as yet? Is this one sprite based game too many for you? 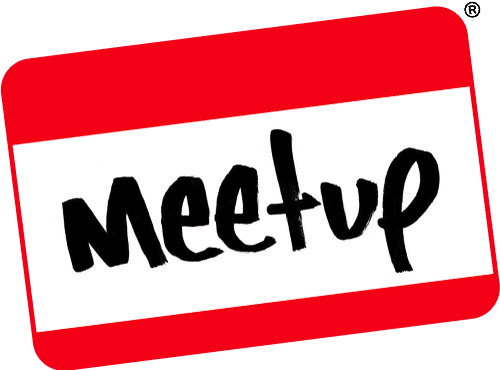 Give us your feedback via the comments section or over on Facebook, Twitter or Reddit. This entry was posted on October 11, 2017 by catharsisjelly. It was filed under Gaming posts, Reviews, Video Games and was tagged with 2D, gunpoint, heat signature, Indie Game, Pixel, Review, Rogue-Like, Sci-Fi, sprite, video game.